Protect your investment from damage with Guard Dog’s padded Premium Laptop Sleeves. 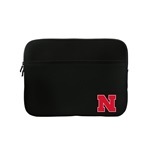 Each Laptop Sleeve is adorned with a colorful embroidered patch of the Nebraska Cornhuskers logo to show off your team pride in style. The Laptop Sleeve features a main zippered pocket for your laptop or tablet and fits a laptop or tablet up to 12" (when the device's screen is measured diagonally). 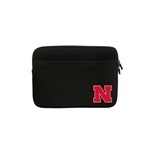 The front of the Sleeve sports another large zippered pocket, perfect for cords, pens, or accessories. 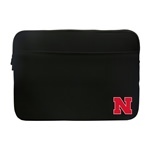 Nebraska Cornhuskers Premium Laptop & Tablet Sleeve 11/12"
Nebraska Cornhuskers Premium Laptop Sleeve 13.5"
Nebraska Cornhuskers Premium Laptop Sleeve 15" - 15.4"
Nebraska Cornhuskers Premium Laptop Sleeve 15.6"